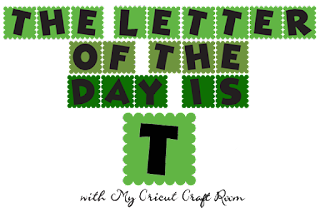 Welcome to the Letter of the Day over at My Cricut Craft Room! For today's theme, I used the Tie the Knot cricut cartridge to create these monogram notecards. Using the monogram feature, I cut of the scallop circles at 2 inches. The base is 4 x 5.5, which I got as a value pack from Hobby Lobby. I used Island Indigo, cut at 3.75 x 5.25, as my first layer. The second is was cut at 3.50 x 5 and embossed for some added texture. I found some ribbon in my stash that matched the Island Indigo. These notecards make good thank you notes or a just because notecard to someone! I hope you enjoy! Don't forget to visit My Cricut Craft Room to see all the other projects from the design team. Beautiful Candice!! I love the color and the texture! Love, love, love these Candice! What a great gift idea!